We at Flashframe have made another huge push in the past week to bring you a litany of new features to exceed what others photography sites can provide. We want to help drive every single dollar possible into your pocket, and that means a new push into extra marketing features. While we previously posted how we had matched the features of our former competitor, Backprint, as detailed here. We're now happy to say we've only brought on stronger and more effective tools to help bring your photography sales into the twenty-first century and help you earn every possible dollar out there. While we've long had the ability to email customers about their photos, we're excited to now allow the ability to create your own drip campaign. 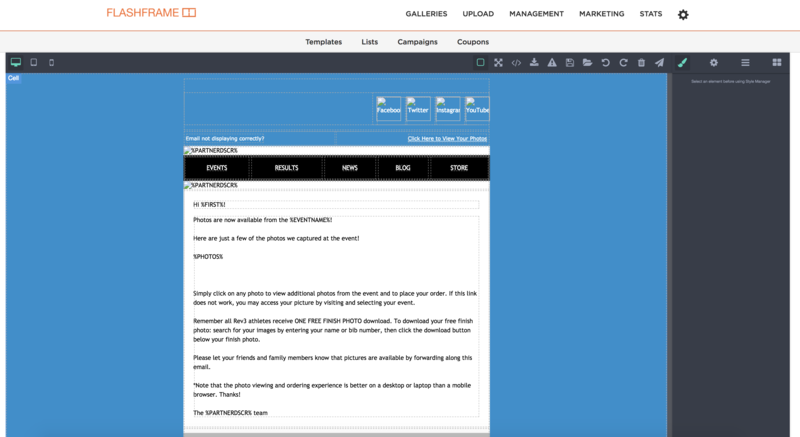 The first crucial step in the process is drafting a unique email, and we now allow for completely custom template creation. You can either upload your own HTML, or draft the template using our unique drag and drop software. After creating your own custom template, you can then upload your email lists, which we will help you properly format when you select the proper column header. Without an email column, we will not allow you to upload your list. Other information such as bib number, first name, and last name, can help us add additional tags to photos if added. 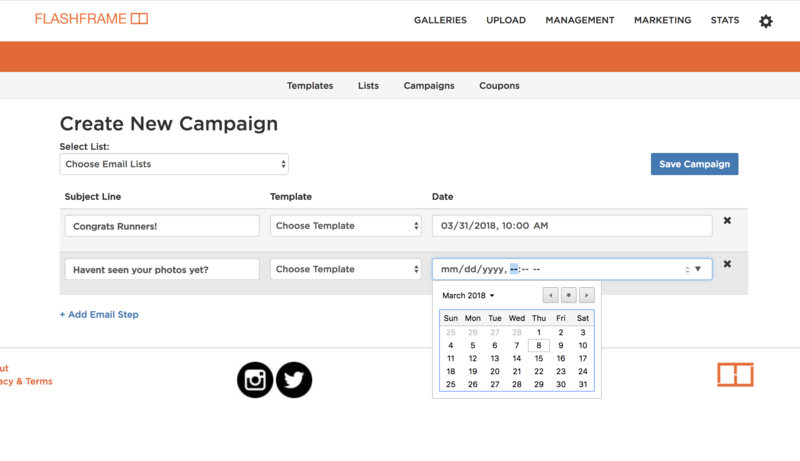 Most importantly in the process, you can create custom drip campaigns. You can choose to email event participants as many or as few times as you dictate. You can set custom subject lines for each round of emails, which email template you want them to see, and at what specific date and time. At the end of the day, we have made this part of our site infinitely customizable to allow you to figure out what drives the most value to you and your photography business. After all this is done, you can view stats roll in, and monitor clicks, views and opens for each step in the marketing campaign. Another new addition to Flashframe is the ability to create coupons. You can now send participants a coupon for one free digital photo, two free digital photos, a fixed dollar discount, a percentage discount, or give all free digital photos to a few select participants. These are all redeemable in the Flashframe cart right before checking out. Ultimately these new additions will allow you upload and process photos quicker than ever before, letting your users get access to those precious memories sooner, in turn driving more value for both your clients and yourself! Let us know if you have any questions and good luck at your next race!